NordenBladet – Sveriges Riksbank, or simply Riksbanken, is the central bank* of Sweden. It is the world’s oldest central bank and the 3rd oldest bank. The Riksbank began operations in 1668. Previously, Sweden was served by the Stockholms Banco (also known as the Bank of Palmstruch), which was founded by Johan Palmstruch in 1656. Although the bank was private, it was the king who chose its management: in a letter to Palmstruch, he gave permission to its operations according to stated regulations. But Stockholms Banco collapsed as a result of the issuing of too many notes without the necessary collateral. Palmstruch, who was considered responsible for the bank’s losses, was condemned to death, but later received clemency. On 17 September 1668, the privilege of Palmstruch to operate a bank was transferred to the Riksens Ständers Bank (“Bank of the Estates of the Realm”) and was run under the auspices of the parliament of the day. Due to the failure of Stockholm Banco, the new bank was managed under the direct control of the Riksdag of the Estates to prevent the interference from the king. When a new Riksdag was instituted in 1866, the name of the bank was changed to Sveriges Riksbank. Having learnt the lesson of the Stockholms Banco experience, the Riksbank was not permitted to issue bank-notes. Nevertheless, in 1701, permission was granted to issue so called credit-notes”. Some time in the middle of the 18th century, counterfeit notes began appearing, which caused serious problems. To prevent forgeries, it was decided that the Riksbank should produce its own paper for bank-notes and a paper-mill, Tumba Bruk, was founded in Tumba, on the outskirts of Stockholm. From 1991 to 1993, Sweden experienced its most severe recession since the 1930s termed the “Swedish banking rescue”. It forced inflation down to around 2%, and inflation continued to be low during the subsequent years of strong growth in the late 1990s. During the 2000s, the operations and administrative departments were downsized on behalf of the policy departments Financial Stability Department and Monetary Policy Department. A direct consequence of the changing times was that the Riksbank closed down all its branches in Sweden and outsourced the handling of coins and bills to a private company. Today the policy departments are the core of the central bank and they employ about half of the bank’s 350 full-time posts. 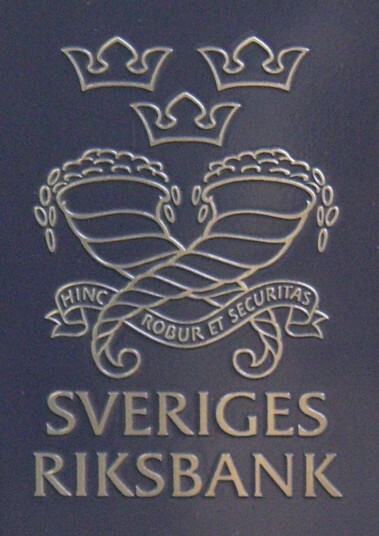 The motto of the Bank is Hinc robur et securitas, which is Latin for “Herefore strength and safety” (“Härav styrka och säkerhet”). * A central bank, reserve bank, or monetary authority is an institution that manages a state’s currency, money supply, and interest rates. Central banks also usually oversee the commercial banking system of their respective countries. In contrast to a commercial bank, a central bank possesses a monopoly on increasing the monetary base in the state, and usually also prints the national currency, which usually serves as the state’s legal tender. Central banks also act as a “lender of last resort” to the banking sector during times of financial crisis. Most central banks usually also have supervisory and regulatory powers to ensure the solvency of member institutions, prevent bank runs, and prevent reckless or fraudulent behavior by member banks. Central banks in most developed nations are institutionally designed to be independent from political interference. Still, limited control by the executive and legislative bodies usually exists.